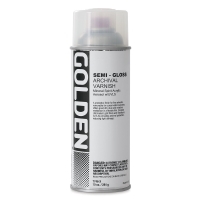 Golden's Archival Spray Varnish provides a protective finish layer for fine artwork, removable for conservation purposes. Offers excellent dirt, dust, and moisture resistance. Contains ultraviolet light filters and stabilizers (UVLS).